The New Economy: Our system is based upon an old idea that companies succeed the most when they divide production into small, rote tasks to be handled by inexpensive workers. However, in a time of ever changing technologies, this process leads companies to stall further development. The solution is for companies to find linchpins–indispensable people who have the ability to adapt and complete varied tasks. Power to Create: In the past, the economy was driven by white-collar workers who were no more than cogs in a machine–dispensable and lacking the ability to innovate. Godin combats this perception, stating that since the current mean of production is a laptop computer, almost everyone owns their own means of production. With this change has come a new hierarchy of value: lift, hunt, grow, produce, sell, connect, create/invent. The higher up a person is, the better job she or he has, the more she or he is paid, and the less job competition she or he experiences. Since everyone now has the access, it is more important to stand up and create. The New American Dream: The old American Dream was a sort of promise; if a person works hard and follows the rules, he will be rewarded with a stable job and good life. This promise does not work in the current knowledge economy. The new American Dream is: “be remarkable, be generous, create art, make judgement calls,” and “connect people and ideas” (Godin 33). Those are the characteristics that are looked for–embracing those is how people can get ahead. Everyone is Creative: We are often told only artists are creative and that everyone else is simply working. However, this is too narrow definition of the creativity. People create every day, and that creation should count. Everyone has the ability to be creative. Fix the Problems You Find: Working at a startup means that you constantly run into problems that need to be fixed. Instead of pointing out a problem and waiting for someone else to fix it, you should do it yourself. 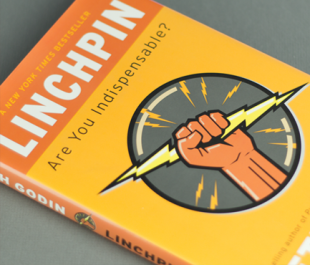 Linchpins are remarkable and indispensable because they do tasks that are not required of them. Our supervisor Katie Hurst told us her goal in reading Linchpin with us is to “challenge you guys to think outside the box when it comes to your education and what your professors are telling you, to think about yourself as a creative individual and about how your talents fit into the new economy.” Our readings and discussions are definitely helping us do this!